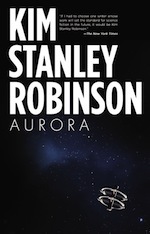 In 2312, Kim Stanley Robinson makes references to performance artist Marina Abramovic several times, through the activities of the main character, Swan. After 2312's release, in 2015 Robinson and Abramovic got together and created a collaborative work, along with the help of composer/sound mixer Adam Tinkle and the Arthur C. Clarke Centre for Human Imagination. Today, the end result is the audio performance "The Hard Problem: An Audio Voyage", and you can download it here! In winter of 2015, the Clarke Center produced a collaborative project with the performance artist Marina Abramović and the science fiction author Kim Stanley Robinson. The multi-day workshop cultivated a series of interactions between a story that Stan was writing about a multi-generational spaceship heading to another star, and the performance art gestures of Marina’s that are a journey into our inner self. We improvised readings and performance actions to find the ways in which these seemingly diametric experiences touched on the common idea of how we extend our sense of time and space from the moment to the eternal. Out of this, we created an installation with multiple audio tracks, which was then further developed for the Venice Biennale. We also made a short film, which you can find a link to on the podcast webpage, and the audio tracks were mixed and choreographed by Adam Tinkle into the podcast we are featuring today: The Hard Problem: An Audio Voyage, by Kim Stanley Robinson, Adam Tinkle, Marina Abramović and the Arthur C. Clarke Center for Human Imagination. The audio elements were produced during a day-long workshop with Abramović and Robinson at the Clarke Center, which subsequently appeared at the Venice Bienalle. The audioscape is rich and haunting, and has moments of goosepimple-raising eeriness as the narration invites us to put ourselves in the mind of an AI plying the spaces between the stars. See also this La Jolla Light article from 2015. Back then the work was called "3015: Work In Progress". Also available at the Marina Abramovic Institute. In that same link from the Reykjavik International Literary Festival there is also a recording of a panel on "The Environment, the Future and the Future of Writing", with Robinson and Andri Snær Magnason (both Friday September 11).